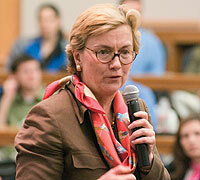 Nancy M. Barry's acceptance speech as recipient of the 2004 Kellogg School Award for Distinguished Leadership felt more like an uplifting sermon. Her audience at the award presentation, held this spring at the James L. Allen Center, seemed more like a coégregation. They listened raptly as Barry, president of Women's World Banking (WWB), imparted her recipe for what makes a successful leader. The most important ingredient, she said, is "connection with a power greater than ourselves to build a spiritual core in a world of uncertainty." Other leadership traits include the ability to identify one's passion and cultivate the insight to understand one's purpose in life. Barry also accented the importance of connecting with one another to realize the power of uniting people by their many similarities rather than dividing them by their relatively few differences. Barry constantly keeps that belief in mind at the not-for-profit Women's World Banking, where she has been president since 1990 and a member of its board of trustees since 1981. Having created a global community through WWB, Barry "defines the culture of the Kellogg School, its sense of community and its nonprofit endeavors," Kellogg School Dean Dipak C. Jain told the audience. He added that she is the ideal recipient for the Award for Distinguished Leadership, given by the student-run Business Leadership Club in honor of the example set by Kellogg Dean Emeritus Donald P. Jacobs.